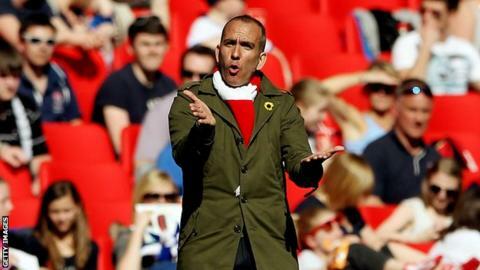 A championship-winning season, eight victories over higher division teams and the added bonus of watching an animated Paolo Di Canio on the sidelines - it cannot be said that being a Swindon fan has not been entertaining over the last 14 months. Since Di Canio became manager in May last year, only four visiting teams have left the County Ground victorious. So formidable have Swindon been on home soil that they went over a year unbeaten, winning an incredible 24 out of 27 games during that run. However, such entertainment comes at a cost and in last year's BBC Sport Price of Football survey, Swindon were ranked as the second most expensive team to watch in League Two, with their lowest priced ticket £19 and their highest £25. After storming to the League Two title, the club for this season and, being in a higher division, these are now more in line with a number of their rivals. Home fans are certainly being entertained. Already, Swindon have put three goals past Championship opposition at the County Ground, beating Brighton 3-0 in the Capital One Cup, before winning 3-1 against Burnley later in the competition. The reward for their impressive progress is an enticing fourth-round tie at home to Premier League Aston Villa this month. "It is not a coincidence that our fans will have the privilege to watch another Premier League team, and thanks also go to them for paying the money to help that happen," Swindon manager Di Canio told BBC Sport. "Eight times out of 10 we have gone out and got a victory against higher division teams, but even without a victory it will be a good show." It is not just in the cup competitions that Swindon have been performing well, with the Robins currently sixth in League One. Of the last four home games in the league, Swindon have won just one but Di Canio believes that, more often than not, home fans will be leaving the County Ground happy. He added: "Obviously not all performances are great. I am sure there are some fans who want their money back when we lost two at home recently. "But they can see a team that stays close to the top of the table, has a good chance to win and they can go home happy at the weekend that their team are near the top. "At this moment, the fans can come and dream something positive, but you have to pay. "If you want a good product then you have to spend a bit more, but in general I agree with the prices and I don't think they are a big, big problem." The purchase of a programme is a routine part of a many fans' matchday ritual. Swindon's programme, priced at £3, has been recognised at the Football League awards for the last two years, winning League One programme of the year in the 2010-11 campaign and the League Two equivalent last season. They also have an offer where fans can purchase a programme and the latest edition of FourFourTwo magazine - one of the club's sponsors - for £5. "We try to put as much value into it as we can, which means we need as much exclusive content as possible," said Swindon's media manager Chris Tanner. "It also helps having it all designed in-house. "We feel it is a very popular programme. We sold out last Saturday against Coventry and we have had a couple of sell-outs this season. "It is very good product in a difficult economic climate."